A thin piece of tin, measuring about one inch wide by nine inches long, feeds into a press. Don Stevenson carefully turns a crank until it slides out the other side. “There you are,” he says proudly as he holds up a perfect sheet of miniature roofing material. He places it on a workbench next to a mini shingle cutter and an old table saw, which has a wobbly blade that adds a rough-hewn look to wood. 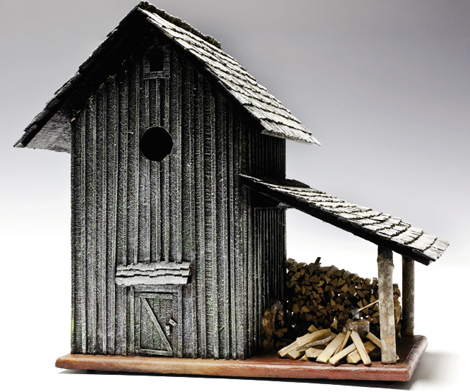 The application is ingenious, but so are Stevenson’s miniature homes and birdhouses. Stevenson began building these small works in his Morganton garage-studio during the 1990s. Each historic reproduction of a Southern farm, fortress, or outbuilding exhibits his obsession with detail—from the weather-resistant materials he selects to the patina he paints to simulate a building’s age. More than architectural works, his pieces capture hints of life that might surround each home. For instance, a modest farmhouse features a stack of matchstick-size logs close to the front door and a tiny, well-used ax leaning against it. And Stevenson has a history lesson to go with each building. He can tell you where he spotted it, what type of worker, farmer, soldier, or statesman once lived in it, and why certain architectural elements were used in its construction. In many ways, these tiny dwellings embody an unparalleled form of historic preservation. It’s little wonder his commissioned works are so sought-after, starting in the hundreds of dollars and reaching into the thousands. “Depending on the complexity of the architecture,” he says, “some take a week to complete.” Others require many months. No matter the time, he’s committed to getting each one just right.